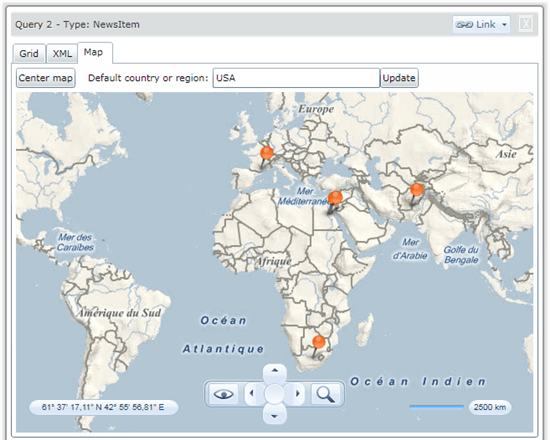 Lohith G N (aka Kashyapa) has just published a tour of Sesame Data Browser for OData on his blog. He did an excellent job! 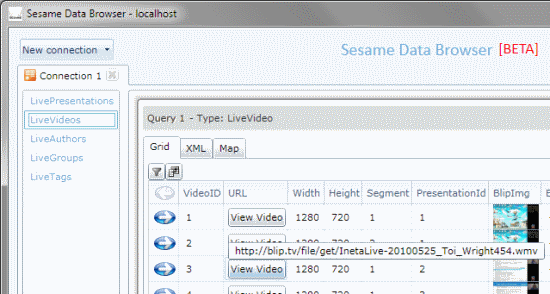 I strongly advise you to head to his post to learn what Sesame Data Browser has to offer and how to use it. During MIX11 this week, Pablo Castro, Software Architect in the Data and Modeling Group at Microsoft, gave a talk named “OData Roadmap: Services Powering Next Generation Experiences“. 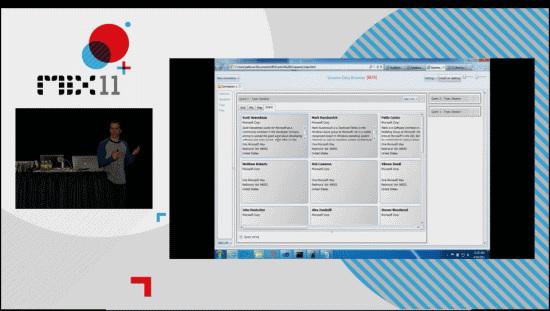 Pablo gave demos of what’s cooking for OData and what to expect over the coming months. One thing that he demonstrated was extensibility with Shared Vocabularies. 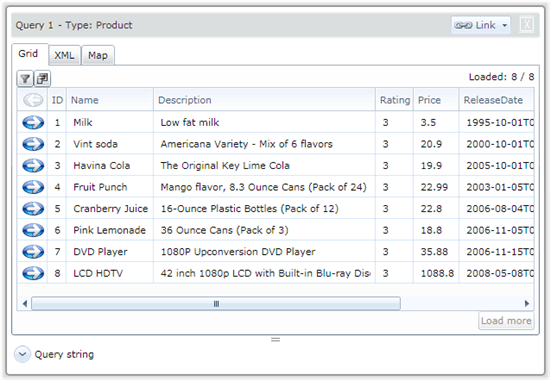 This allows tools and applications to offer a richer experience through annotations on OData feeds. Pablo used Sesame Data Browser as an example of how Shared Vocabularies can be used. With annotations on the MIX11 Speakers and Sessions feeds, Sesame is able to display visit cards (VCards) for speakers and a calendar view containing sessions. I invite you to watch the video recording on the session’s page. The demo starts at 0:52:34. 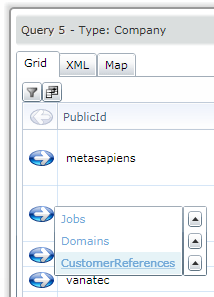 Vocabularies for OData were introduced on the OData blog. The current stage is exploratory and implementation is open for discussion in the OData mailing list. 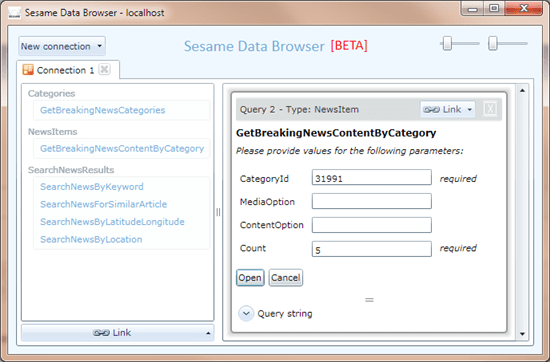 Note: this feature is not available in the currently public version of Sesame Data Browser (1.0.7). Some time ago I had the pleasure of being interviewed by Microsoft and Telerik about Sesame. The results are two case studies. I was impressed by the job done by the interviewers and the editors. The first case study covers Sesame Data Browser‘s support for OData and Windows Azure Marketplace DataMarket – No doubt… that’s a Microsoft product name. It was called Dallas previously. I just call it Azure DataMarket. The second case study is about how the Telerik RadControls for Silverlight product was useful for creating Sesame Data Browser. 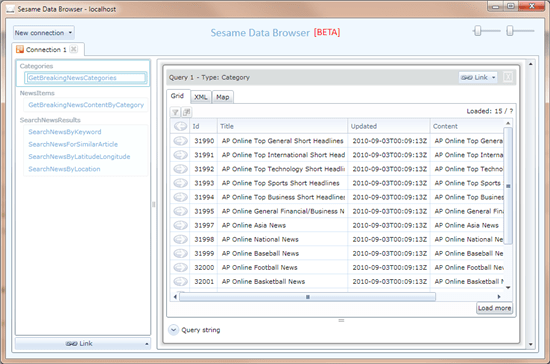 Sesame Data Browser has just been improved with new features. You no longer have to enter the same addresses again and again. Sesame Data Browser will now remember the addresses you used and suggest them to you the next time you want to open a connection. The authentication settings are restored for each address you reopen. Hint: pressing the Enter key will make re-opening a connection even faster. Until now, Sesame offered support for pictures, but not for videos. 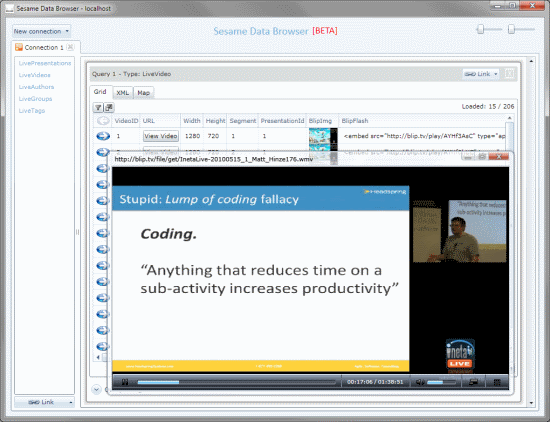 I’m pleased to announce that videos can now be displayed right inside Sesame. You can give this a try with the INETA Live service (http://live.ineta.org/InetaLiveService.svc/), for example. If you open the LiveVideos feed and click on the “View Video” button for a video, that video will start playing. Complex types are not displayed by default any longer. A click on a button is now required. Displaying all complex types immediately consumed to many resources. If you want to see this change in action, open the Netflix service and select the Titles feed. You will see a View button for the BoxArt, Instant, Dvd and BluRay columns. Clicking on this button reveals the content of the cells. 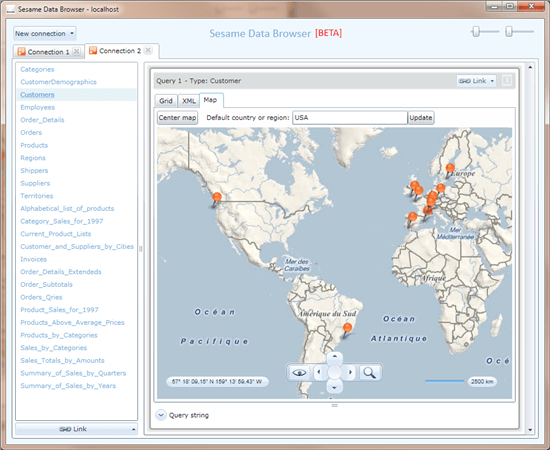 Previously, Sesame Data Browser wouldn’t work with no Internet connection because it loaded the OData support from a dedicated package from metaSapiens.com each time. This package is now embedded in the main package, so no additional loading is required when Sesame Data Browser is installed on the desktop. Of course, this is useful only when you browse local services with no dependencies on remote services or data. Finally, because your feedback is important for the future of Sesame, you can now use a UserVoice forum to suggest improvements and to report issues. 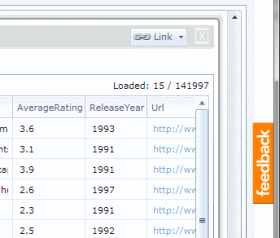 This feedback forum is also available from the Sesame Data Browser preview page via the orange Feedback button. Please try the new version now and let us all know what you think. 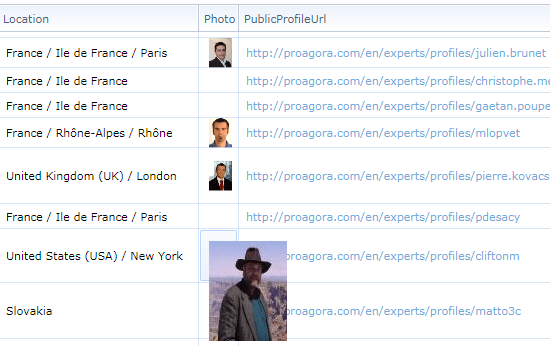 There’s a new OData kid on the block: The data from Proagora.com is now available as OData. 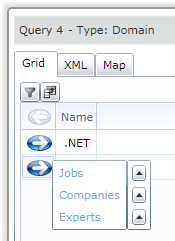 As on the website, data published as OData is about jobs, companies, and experts. Known issue: Columns/properties selection ($select) fails with an error. I haven’t found a solution yet. Please give this a go and send me your feedback. 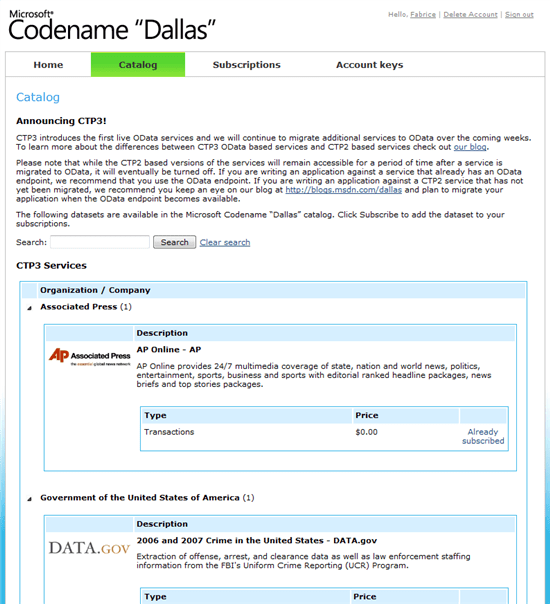 With the release of Microsoft Codename “Dallas” CTP3 and the features announced in the previous post, it became easier to add support for Dallas to Sesame Data Browser. The new version of Sesame published today allows you to browse Dallas datasets, as demonstrated below. Creating a connection to a Dallas dataset in Sesame is easy. You just need a dataset URL and an account key. Note: Only CTP3 services are supported in Sesame. Once you have a subscription, you can visit its preview page. This is where you’ll find the URL you’ll use in Sesame. 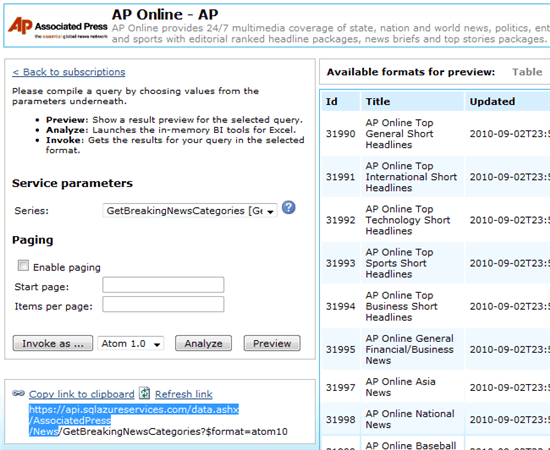 The URL for AP Online is highlighted in blue on the above picture. Copy a category ID and click on GetBreakingNewsContentByCategory. A bug in Dallas CTP3 prevents the “Load more” button to work correctly in all cases. Dallas CTP3 does not support all filter operations. Namely, the EndsWith, StartsWith, Contains, DoesNotContain and IsContainedIn don’t work with Dallas datasets. Please give this new version a try. As always, your feedback and suggestions are welcome! 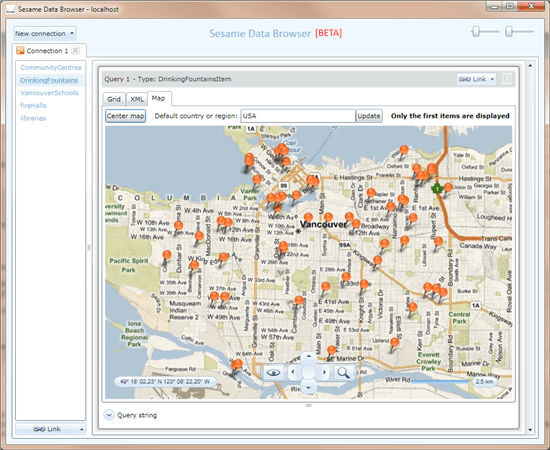 Sesame now automatically displays items on a map if spatial information is available in data. This works when latitude and longitude pairs are provided. This comes from DrinkingFountains in http://vancouverdataservice.cloudapp.net/v1/vancouver, which provides latitude/longitude for each fountain. This is a map of the customers from the Northwind database, which are located based on their country, postal code, city, and street address. Support for service operations (aka FunctionImports) has been improved. Until now, only functions without parameters were supported. It’s now possible to use service operations that take input parameters. 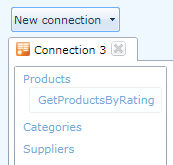 Let’s take as an example the GetProductsByRating function from http://services.odata.org/OData/OData.svc. New authentication options have been added: HTTP Basic and Dallas (more on the latter in the next post). HTTP Basic authentication just requires a user name and a password, and is simple to implement. 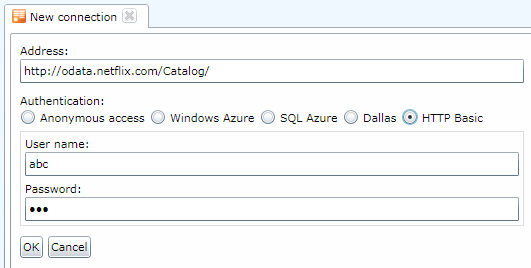 All of the above features enabled support for Microsoft Dallas. See this other post about Dallas support in Sesame. Please give Sesame Data Browser a try. As always, your feedback and suggestions are welcome!